Becoming British just got trickier. Under a new government proposal announced on Aug. 3, would-be Brits may have to work a little bit harder to get their citizenship when a second test is added to the country’s points-based immigration system. If the plan goes through, applicants would serve a term as “probationary citizens,” winning or losing points on the path to the passport depending on how well they fit into British society. The United Kingdom is one of a handful of countries  including Australia, New Zealand and Canada  that already use points-based systems to determine who can live on their shores. The points generally concentrate on language proficiency, work skills and family ties. Now the U.K.’s Home Office is proposing a second stage, with a second round of points, with the goal of ensuring the continued integration of those who would become citizens while also giving the government greater flexibility over the number of people who get to stay permanently. This new test would judge applicants on how they conduct themselves while living in the U.K. Choose to move to Scotland, where the population is declining Win points. Exhibit antisocial behavior Lose points. Return to your Third World native country to aid development Win points. Display “active disregard” for U.K. values  which could include protesting the wars in Iraq or Afghanistan Lose points. Prospective citizens may also be able to fast-track their candidacy by volunteering or canvassing for political parties. “This test would challenge what has been perceived as an automatic right to move from temporary residence to permanent settlement, giving Government the flexibility to raise or lower the threshold for settlement based on the needs of the country,” writes Immigration Minister Phil Woolas in the proposal, which is undergoing a public review. Immigration is a hot-button issue for British voters, with the recession fueling fears that Brits are losing already scarce jobs to foreigners. In a Home Office poll released in February, 64% of respondents said they were dissatisfied with the government’s immigration policies. That same month, the government responded to the economic downturn by toughening the points system for getting a visa into the country. Now it argues that a second, more difficult test to decide who can stay would give it an additional mechanism to respond to the needs of the U.K.’s workforce. Even so, the new test would cover only a fraction of the people who go to work and live in the U.K. Last year about 129,000 immigrants were granted British citizenship. Yet the nation is also home to an estimated 725,000 illegal immigrants and attracts many workers from across the European Economic Area who have less incentive to seek citizenship since they can legally work in the country without visas. 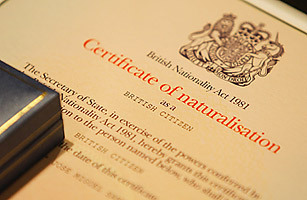 Currently, barring any criminal record, most who settle in the U.K. can apply for citizenship after about five years. The new probationary-citizen plan would lengthen an immigrant’s total wait to an estimated six to 10 years, according to the Home Office. According to Jean-Christophe Dumont, an international migration specialist for the OECD, the longer wait could mean the new test actually has the opposite of its intended effect. He points to studies carried out in Europe, the U.S. and Canada that have shown that once granted citizenship, immigrants perform markedly better in the job market than they did while they were waiting to get their passports. “The less certitude there is  the longer the process takes  the less an immigrant might invest in his host country,” he says. Critics have also attacked the ways points could be awarded. Some worry that the “active citizenship” fast track would coerce candidates into volunteering, while the suggestion of political canvassing raised more than a few eyebrows. Some note it could lead to a bias toward the ruling Labour Party. The new test wouldn’t go into effect until 2011, and even then, there’s no knowing how much of the proposal will actually make it into law. But no matter what kinds of points or tests end up getting the green light, it’s clear that the road to becoming British is about to get longer and harder. See the top 10 outrageous British expense claims. See pictures of London’s Underground.